Well, this week's PGA Tour event, the John Deere Classic, hasn't drawn many stars in the past few years (unless of course you can't Wie). However, while reigning Masters champ Zach Johnson is playing host to the event in Iowa, many of the game's brightest are across the pond preparing for the Open Championship at Carnoustie. More importantly, Phil Mickelson may have found his form again by shooting a 65 on Thursday, which included an eagle and five birdies. 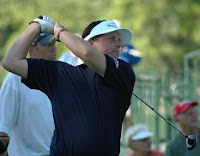 However, Lee Westwood and several other European journeymen are tied with Lefty at the top. Ernie Els crawled into the clubhouse with six birdies, but four bogeys. Luke Donald shot 70, and U.S. Open champion Angel Cabrera shot 71. If Lefty gets a spark soon, who knows what could happen at Carnoustie. 0 Response to "Lefty in full force at Scottish Open"